The violent details surrounding the OVO affiliate’s death have been revealed. 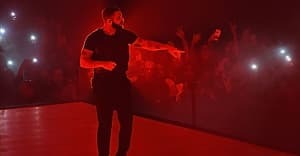 Last week, Drake revealed that his longtime friend and OVO affiliate Anthony Soares, Fif, had died. Drake commemorated his friend with a new tattoo of a realistic portrait of Fif, and today the details of the 33-year-old’s tragic death were shared. Camera footage from Toronto released by police show that Fif was shot to death in public. On Thursday September 14, Fif was standing in the lobby of a building when two unidentified gunmen covered by hoods shot through the window and killed him. The footage was released in an effort to identify the shooters. “The deceased was trapped between the inner foyer area and the offenders who were on the opposite side of the glass,” said Detective Sergeant Gary Giroux of the Toronto Police Homicide unit. The gunmen fired more than a dozen times before fleeing in a white Ford Fusion. In a press conference, police said that Soares had a criminal history in Toronto, but that the shooting appeared unrelated to gang activity. The police encouraged Drake to ask others in the community to come forward with information about the murder. Fif was taken to a hospital after the shooting, but efforts to save him were unsuccessful. “Certainly, it was very targeted. It was very focused. Certainly, it was overkill,” Giroux said. Fif had a toddler daughter with his girlfriend.